I have a confession to make: I think I must be a basil addict. Every year I seem to add another variety of basil to the pots and troughs on various windowsills throughout the house. It started, as I suppose these things do, with the apparently harmless classic Italian basil, packaged in a deceptively friendly-looking envelope from Seeds of Italy. At first this seemed more than enough: this is the aromatic, fleshy-leaved variety, the same as the fresh basil sold growing in the pot in supermarkets. Even if I wasn't cooking with it at any given moment, it was still a pleasure just to brush one's hands across the leaves for a rush of heady aroma. But when it came to seed buying the next year, I wanted more. Lemon basil, with a citrus overlay to the distinctive clove fragrance, seemed to fit the bill, and produced tall, willowy plants which wafted scent around the kitchen every time I opened the door to let in breeze. The year after that I was looking for a warmer basil aroma again and found cinnamon basil, with gentle spice notes which contrasted with the sharper lemon variety. By the time I discovered how easy it was to grow Thai basil (pictured above) and how wonderful it was to liberally apply its leaves to curries and indeed any coconut-based dishes, I knew I was hooked. Holy basil came next, and now, this year, I've come full circle back to Seeds of Italy and its Neapolitan large-leaved basil - a variety with leaves as big as lettuce, I'm promised. Will that be enough to satisfy my basil-lust? I've also flirted with Greek basil (small pointy leaves), lime basil, purple basil (beautiful but duller in flavour) and holy red basil (which was identical to holy green basil until I transplanted it outside and only then did the leaves turn truly red). 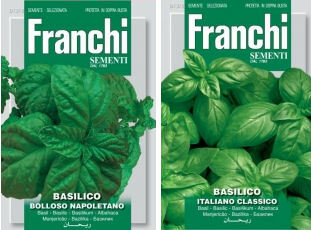 Now is the right time to start thinking about sowing basil, with the days getting longer and the light levels rising, and since I'm not about to give basil up any time soon, what other varieties should I try?